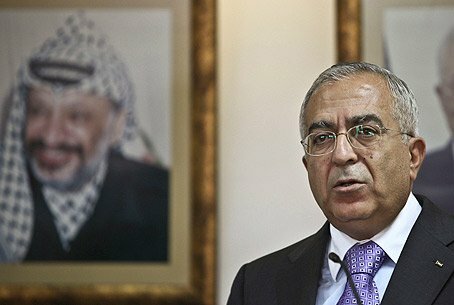 Mainstream media have hyped Salam Fayyad's economic revolution as propeling the PA into a new Arab country. A US professor debunks the myth. A professor of the prestigious George Washington University has debunked claims in mainstream media that Palestinian Authority Prime Minister Salam Fayyad is leading an economic revolution that will help the PA become a new Arab country. However, his theory is just that, completely theoretical, and does not reflect facts on the ground, according to George Washington International Affairs Prof. Brown, who also is a fellow at the Woodrow Wilson International Center for Scholars and a 2009 Carnegie Scholar. He said that has been trying to follow the institutional development of the Palestinian Authority since it was founded and that on his latest trip, “I found that for every one step forward taken under difficult circumstances, politics in the West Bank has taken two steps taken backwards". Freidman, whose article was based on interviews with Fayyad and senior IDF officers but not with the “man-on-the street,” claims that Fayyad is succeeding. “The Abbas-Fayyad state-building effort is still fragile, and it rests on a small team of technocrats, Palestinian business elites and a new professional security force,” he wrote. Prof. Brown also discredited the common claim that the PA has created “law and order,” as Freidman suggests by his quoting impressed IDF officers. There is no law in the PA because the government is functioning without a legal mandate, the professor explained. He also stated that PA institutions are infected with "political paralysis and authoritarianism and that the Fatah party “is undoubtedly in the greatest disarray,” as shown by the recent party decision to force Fayyad’s cabinet to cancel local elections. The claims of economic growth in Judea and Samaria also have been debunked by a human rights activist, Adri Nieuwhof, writing for the Electronic Intifada. A PA report to donor countries as recently as two years ago "revealed beyond any doubt that economic performance in 2007 and 2008 remained at a standstill, with a growth rate of zero percent," according to Nieuwhof.